This dish is a good source of fiber and low in fat. The bulgur adds just the right density to make it a filling dish served as a side or an entree. 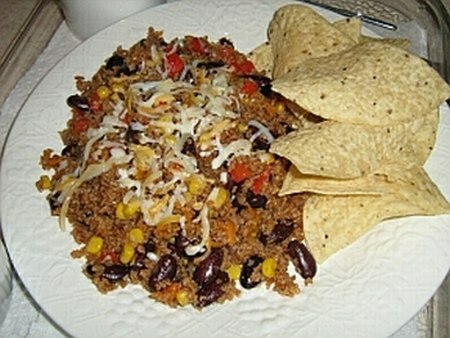 Tex-Mex Bulgur and Beans is a meal itself. It is delicious and brings a great southwestern flavor to the table that simply can't be beat! What is bulgur you ask? Bulgur is a cereal food made from the groats of several different wheat species, most often from durum wheat. It is most common in European, Middle Eastern, and South Asian cuisine and has gained favor in the U.S. because it is versatile and very easy to include in numerous vegan and vegetarian recipes - you know, like Tex-Mex bulgur and beans! The word bulgur is of Turkish origin. Bulgur is, of course, not suitable for people on a gluten-free diet. But otherwise, bulgur is a great way to get fiber in your diet. It lends itself well to many dishes for which you might otherwise use rice or couscous. Stir in the chili powder, sea salt, pepper, garlic and cumin. Add the water and vegetable stock and stir to mix well. to stand for another 10 minutes or until the liquid is absorbed. Place on serving plates and top with cheese. Sangria or the beverage of your choice. Makes about 4 entree size servings. 8 grams of fat, 314 calories, 14 grams of fiber per serving.